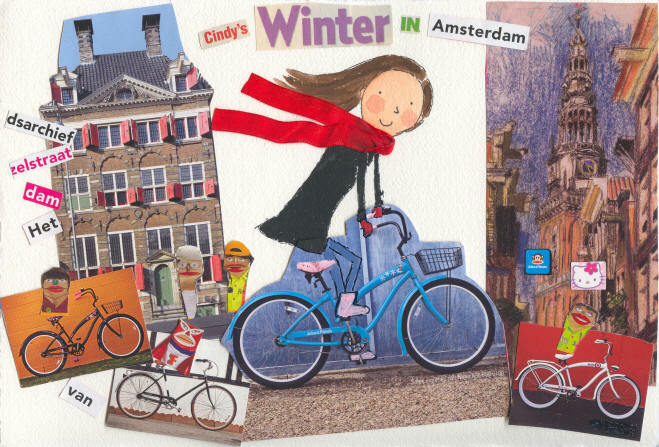 Welcome to "Cindy's Winter in Amsterdam!" On these pages you will be looking at my brand new Cindy Pictures! Cindy Pictures show me, Cindy, doing things I love. I make them for fun and practice. 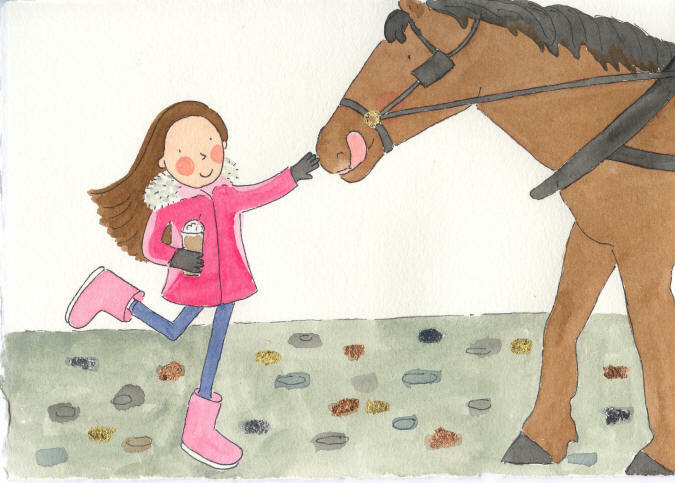 All of the pictures in this gallery are about my real (and imaginary!) adventures spending the winter of 2009 in Amsterdam! You'll find out more as you visit the gallery. They're made with ink, watercolors, acrylic paint, colored pencils, crayon, metallic gel pens, real photos, magazine clippings, labels, shopping bags, glue stick, gold leaf, foil, ribbon, yarn, and thread, on watercolor paper, Bristol board, and plain white paper. Cindy rides a bike through Amsterdam! That's Rembrandt the artist's house on the left, you'll get to visit it later. Notice my amazing fluent Dutch! Actually I am not fluent in Dutch, I made up all the Dutch captions in these pictures just for fun! 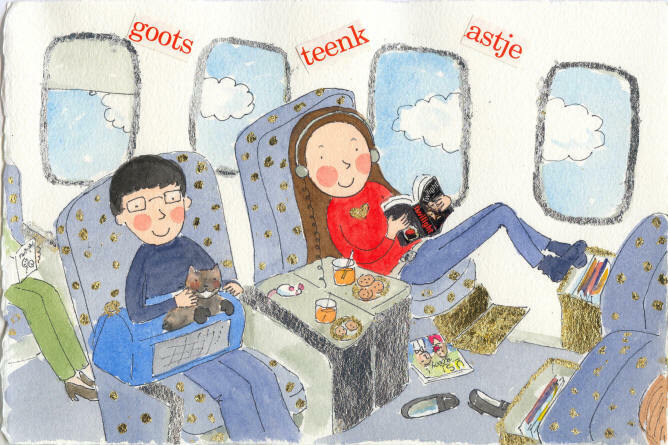 At first it was easy just slapping any Dutch words on the pictures, but by the last picture I had accidentally learned a lot of words and it would take me ages to pick the words I wanted to include! I did lots of the pictures for this gallery while I was actually in Amsterdam, this is the first picture I did after getting home. Cindy and Joey and Tiki fly Lufthansa Business Class to Amsterdam! Business Class is fun because you have tons of leg room and your own TV full of movies you can pick, and you can even turn your seat into a bed. And you can have a little ham and cheese sandwich any time you're hungry! But Business Class isn't really all gold leafed like this picture, I made that up! Tiki flies with us inside the plane and sometimes won't stop saying "meep!" which is how she says meow. After our first time flying with her, someone said, "I heard something squeaking all night, I think it was the overhead bin!" They didn't know a cat was flying in the plane! During the same flight when we fell asleep Tiki got out of her carrier by using her extra thumbs to unzip it and was standing in the aisle when someone noticed her. I always wonder if she was about to go take over the cockpit! Cindy meets Norbert! Norbert is one of the horses who pull the historic carriages that are always waiting in front of the Royal Palace in Dam Square in the heart of Amsterdam. We lived in the historic Grand Hotel Krasnapolsky on Dam Square all winter and our window looked across the square at the Royal Palace so we got to see lots of Norbert and his friends Freddy and Elvis and Kaas (which means cheese! ), and Tiki got to watch them trot by right under our window. Norbert was my first Dutch friend. He followed me because he wanted my frozen blended mocha! I asked if I could give it to him, but his person said he wasn't allowed to have it, it might keep him up all night. So I petted him instead. He tried to be polite but he couldn't help licking his lips! Cindy visits the American Bakery! Just off Dam Square in a tiny, winding old street filled with amazing things like historic pubs that are hundreds of years old, the American Bakery is owned by an American who makes real American style frosted cakes and cupcakes! 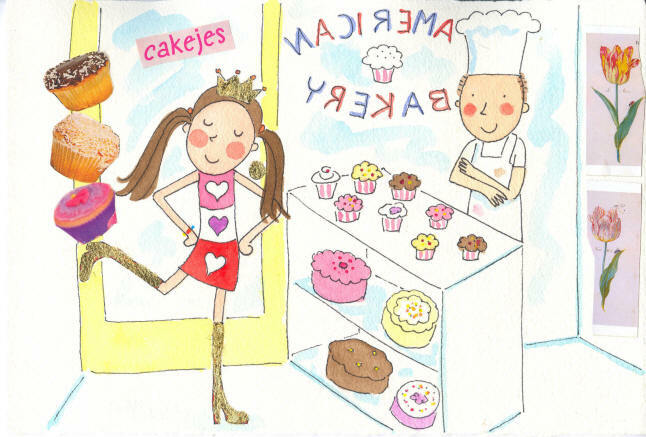 I'm known as the Cupcake Queen because I love baking cupcakes and putting fun and crazy little things on top, so I had lots of fun visiting and chatting about baking--and eating cakes! 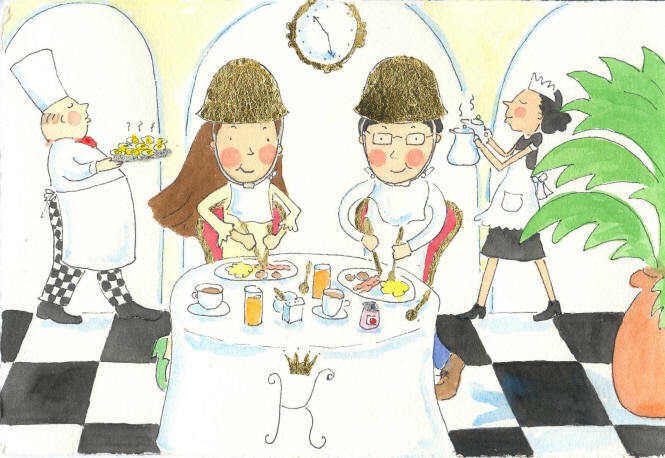 Cindy and Joey eating breakfast at the breakfast buffet at the Grand Hotel Krasnapolsky. The breakfast is in a beautiful historic palm court sort of room with soaring architecture and painted frescoes and has a big buffet covered with miles of every possible dish you could want for breakfast. Breakfast is important in Holland, so you have to take it seriously. A gold plated hard hat is highly recommended for that serious look!